Anticipating maintenance needs is essential to keeping heavy equipment up and running, yet many technicians are hamstringed by inefficient, manual processes. IBM MobileFirst for iOS Asset Care provides maintenance technicians with all the materials and information they need to proactively maintain large, complex assets. 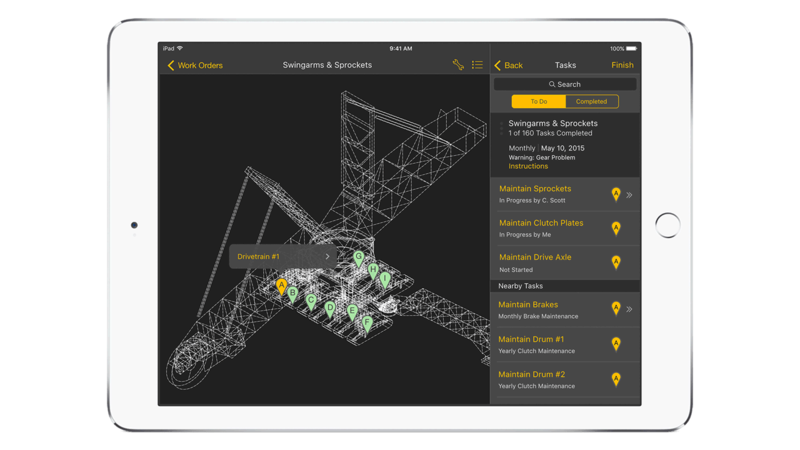 By combining critical data such as equipment performance and technician location with diagnostics capabilities, this real-time app helps increase productivity, reduce equipment downtime and lower the overall cost of maintenance. Capture data at the source and use real-time decision support to uncover the cause of maintenance needs and recommend next best actions. Gain a comprehensive view of asset performance, available resources and technician location to mitigate safety issues. Document issues, optimize work orders, initiate repairs and enable collaboration in the field to streamline and speed maintenance.